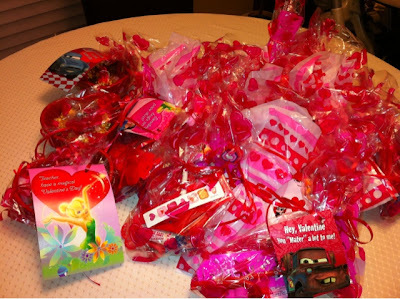 Valentine's eves of yesteryear were spent wrapping a present or writing a card for D. These days it's spent doing the cards for the preschool's classmates, putting the final touches on the treat bags, assembling the teachers' gifts and getting pledges for a dance-athon! Don't worry Darin, you're still my valentine-- you can get a treat bag too. Valentine themed stickers, pencils, sharpeners, candy rockets, Smarties, balloons, rulers. If only these things were around when I was a kid.